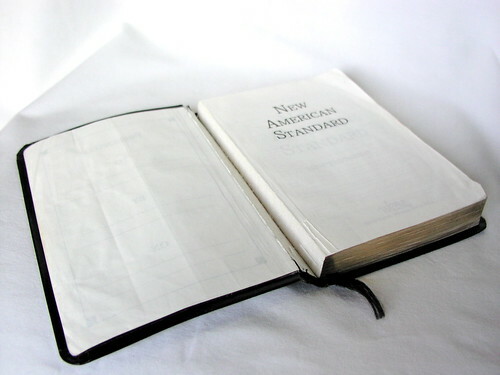 Back in October of 2006, I received an e-mail from Alan Cornett asking for advice on having a NASB New Testament rebound. 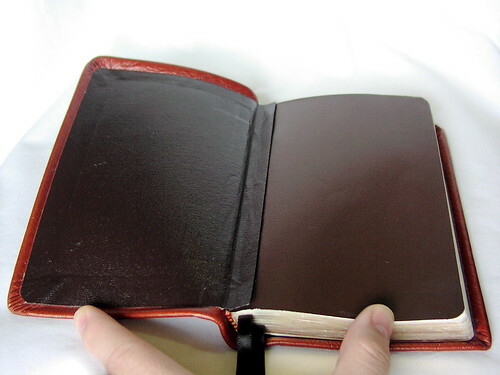 The text block was separating from the cover, but the pages still adhered the binding. I mentioned Mechling as a possiblity, and also threw out McSpadden Bookbindery in Oklahoma. I hadn't used them, but I was intrigued by the videos they'd posted of the rebinding process. 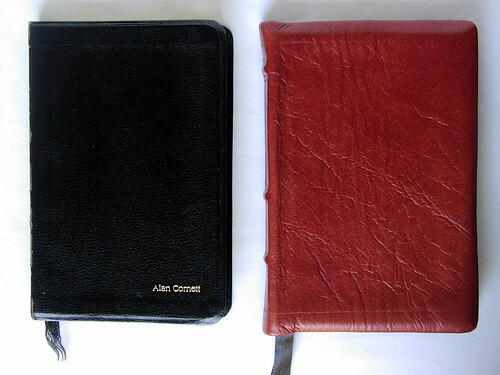 Alan went ahead and sent the NT to them, and has been using it for the past eighteen months or so. Recently he sent me photos of the work along with his thoughts on the process and results. Let's take a look. Above: The problem. The text block is separating from the cover. Below: The solution. 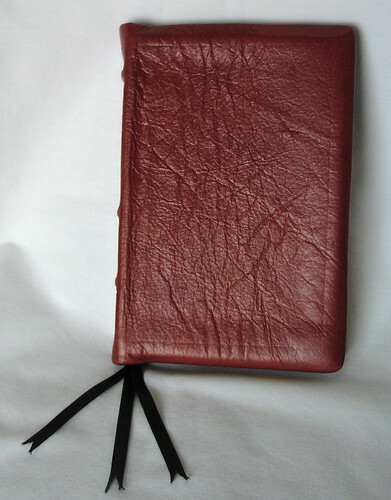 A caramel calfskin cover from McSpadden Book Bindery. "They didn’t have an exact match, so I got their current ‘caramel’ leather. I specified semi-yapp edges, raised bands and three ribbons. 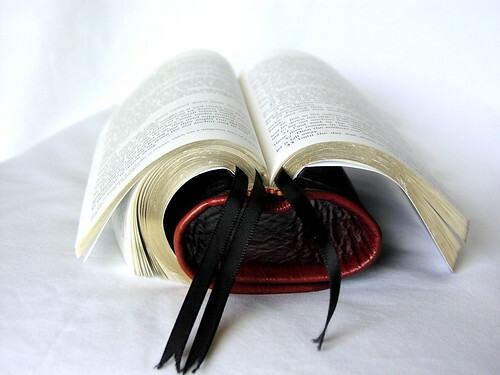 When I got the Testament back I confess my immediate reaction was disappointment. Living with it over the past 18 mos has lessened a lot of that, and reading your realistic expectations post was also helpful. The reality is that there was only so much they could do with a glue bound book with no sewn signatures. When it came back it was fairly tight, not really laying flat at all. Use has opened it up considerably. The real knock isn’t really with McSpadden but rather the cheap way the book was made in the first place. Above: If you start with a glued binding, don't expect the rebound edition to open flat. Instead, the spine will hold together tightly as illustrated, though in time the text block will open a bit more fully. Below: The same problem from another angle. The text block and the cover don't blend organically. Instead, the cover is supple but the text remains stiff. For best results, start with a sewn binding. "McSpadden’s work was a little rougher than I thought it should be, however. 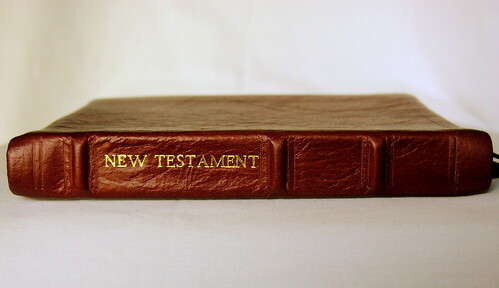 The ‘New Testament’ stamping on the spine wasn’t quite centered, the tooling not as crisp. It was, as you mention in your post, a bit ‘rustic’. Time has lessened my disappointment with that as well. It’s a handmade product that will show irregularities. I would still be open to using McSpadden in the future, but I would try other options before I did. 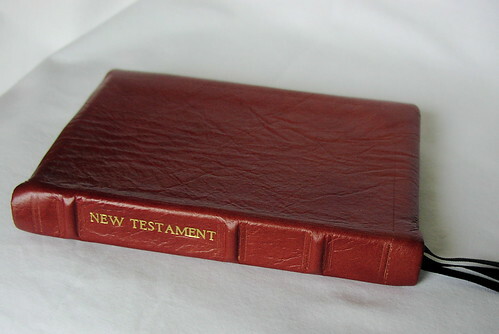 Above: The "New Testament" stamp is a little off. 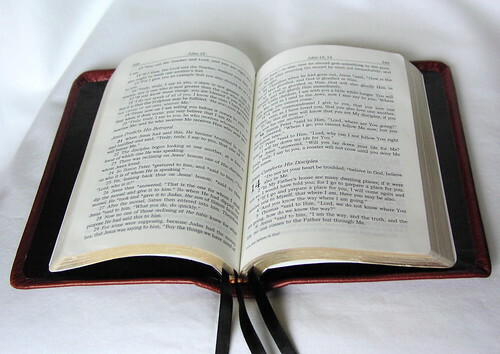 "The good news is I think it’s a beautiful book and it feels wonderful to the touch. It is also now bound solidly enough that I think it could withstand decades of pulpit use without the binding being compromised. It proved to be a learning experience, one that was not terribly expensive and that produced a useful, beautiful edition. "Thanks for your help and for the addictive blog." Above: A nice view of the cover's grain. Below: Another look at the grain. I like it. This is the first project I've seen from McSpadden, and to my eye it looks comparable to what we see from the other rebinders: not as polished as the high-end "factory" editions, but full of character. Alan's initial disappointment will be familiar to most of us here who've gone through the process. Until you open that box, it's always possible that perfection will be waiting inside. But then reality sets in. 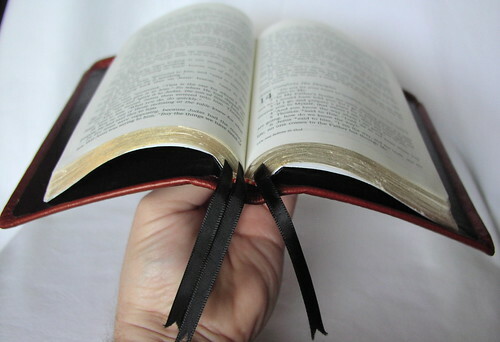 The big lesson, of course -- one that I've learned myself the hard way -- is that the better the Bible is that you start with, the better your results will be. 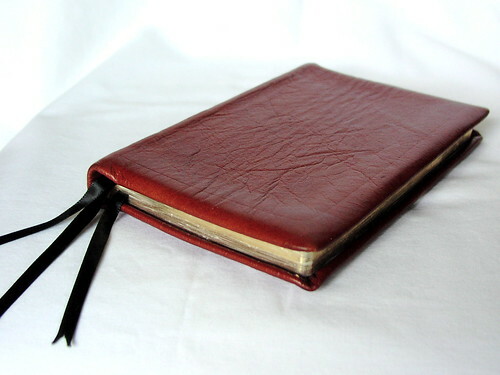 No rebinder can turn a cheap, glued binding into a superior sewn one. Thanks, Alan, for sharing the results of your project!